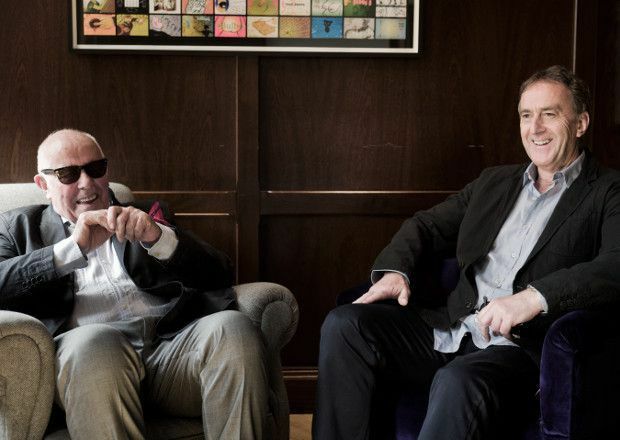 In Soho’s Groucho Club, the favoured London private members’ club of the older, more discerning actor and creative, two old friends are spending an enjoyable morning. They’re being photographed like the Blues Brothers (well, they’re wearing shades), they’re comparing thoughts on the appointment of José Mourinho as manager of Manchester United (their shared team, despite one of them being Scottish and one of them being from Surrey), and they’re trying to work out if they can avoid seeing each other’s Edinburgh show. ‘Good,’ replies Richard Wilson with a satisfied slurp of coffee. They might be appearing (separately) on the Fringe in the same year for the first time, but the actors initially met on the set of One Foot in the Grave, the much-loved BBC sitcom that began in 1990 and ran for six series (and seven Christmas specials). They became firm friends: Greenock-born Wilson (79 when we meet but 80 by the time the Fringe starts) is godfather to the son of Deayton (60) and the pair have had the misfortune of holidaying together. But they’ve never previously been interviewed as a twosome. ‘No, but that’s because we don’t want to be,’ opines Wilson in the dry, mutually-ribbing manner that characterises most of their exchanges this morning. Angus, what makes Richard a good godfather to your son? Richard: I’m not a good godfather! R: I was going to say 22. Richard, why bring back Victor Meldrew? A: … and obviously I haven’t watched it. Oh, it’s been broadcast? I thought it was considered slightly inferior and never put out. R: Yes, it was made and broadcast and actually got very high ratings! The idea was that Victor was on jury service and was on his own, on call. And it was raining, so he couldn’t get out into the garden, he couldn’t do anything, so he just moped about, bored out of his skull. It’s the one where he puts the yucca plant in the bathroom. Which we don’t do, but in the stage show we pretend there is one. A: Yes, but they know nothing, though. They want you to do 56. It’s because all the American series come these days in packages of 26 or something. But the great strength of British writing is smaller series written by one writer rather than a whole team of writers like they do in the States. Fawlty Towers was only six episodes per series for two series. The Young Ones was the same. It’s a magic figure. R: Do you know that in these big American series, actors have to agree to do seven years? For the audition! Before you’ve got the part. Bloody ridiculous. It’s all changing. Did they know each other before making the sitcom? A: No, the first time we met was on the set of One Foot in the Grave, when I turned up to do it. R: Then I discovered that not only was Angus a Manchester United supporter but he had this very lovely friend who was a director there. So Richard sucked up to Angus on the off-chance he might get some plum VIP freebies at Old Trafford? A: Basically. That’s been the foundation of our entire friendship. Richard wants to lig. R: So we became very good friends and indeed went on holiday quite often. And obviously I’m godfather to his son. So it’s not just superficial showbiz. A: It’s not just for PR, but it is mainly. Was there an instant rapport? R: Angus will have to answer that, I can’t remember. A: Well, it turned out that Richard was a fan of the radio show that I was doing at the time, which ties in beautifully with this interview. It was called Radio Active and we’re taking it to Edinburgh this year for the first time in 800 years. It’s really 37 years? That’s a statistic that I don’t think I’ll be repeating. I’ll just say ‘a while back’. Thirty-seven years, that’s terrifying … But actually I was first there in ’78, in a show written and directed by Richard Curtis. The scripts we’re doing this year are ones Geoffrey Perkins and I co-wrote, two radio recordings from 1984. One is the making of a Dickensian drama and the other is a review of the radio’s output that week called ‘Did You Catch It?’ So it’s a re-enactment basically of two radio recordings. Richard, are you looking forward to the socialising aspect of Edinburgh? A: … and some of them aren’t! That’s part of Edinburgh! And now, of course, it’s a sign of the times that I’m seeing not just friends’ shows but friend’s children’s shows. Half my friends’ children are now doing stand-up. Last year I remember Steve Coogan at the Foster’s Awards ceremony saying that there was something like 653 comedy shows. I just thought, ‘how does anyone get noticed these days?’ It’s really difficult. The size of the comedy brochure is roughly the same size as the brochure used to be for the whole festival in my day. It has burgeoned. Will you find time to hang out together in Edinburgh? A: No, we prefer not to actually see each other. R: No, l will go and see his show, if timings allow. But otherwise probably no contact. A: It’s possible we may meet up for a tomato juice early one evening. But that’s it. I Don’t Believe It! An Evening With Victor Meldrew, Assembly Roxy, Roxburgh Place, 0131 623 3030, 16–28 Aug (not 22), 5.30pm, £16–£17.50 (£15–£16); Radio Active, Pleasance Courtyard, Pleasance, 0131 556 6550, 6–28 Aug (not 15), 4.20pm, £12–£15 (£11.50–£13.50). Previews 3–5 Aug, £6.